If you’re in need of experienced, outdoor deck builders, Deck Craft Plus is the perfect business for you. We’re located in Pennsylvania, but we work in several other states including New Jersey, Maryland and Delaware. We provide top craftsmanship and superior customer service to customers. When you need qualified deck installers, we’re your team. Although deck building is our main service here at Deck Craft Plus, it’s far from being our only one. We also offer re-decking services, gazebos, pergolas and porches. If you would like to give the look of your property a fresh new feel, our decking specialties can be a great help to you. Installation of a deck or a gazebo, for example, can be awesome for homeowners who like to entertain friends and family members. Our professional deck builders can really do it all! When you want to work with skilled Amish deck contractors in PA, our company is a terrific choice. If you need a deck for your home, we recommend vinyl! We have many exciting style choices available as well. You can also select deck accessories that can provide an attractive, customized look that truly reflects who you are. No matter what your decking needs and aesthetic preferences are, we can help you pick the most suitable material. Our cellular PVC decks are great for people who appreciate natural and cozy hardwood looks, but desire maintenance free decking with a stain resistant and fade resistant finish. 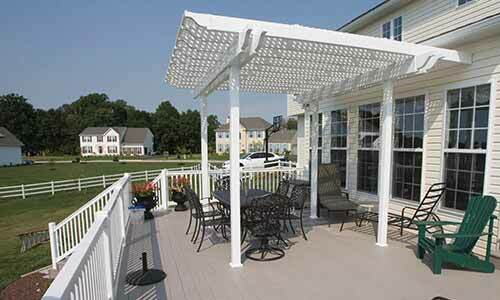 Porches and pergolas are a big aspect of our business, too. If you add a porch or pergola to your home, you can give it a bit of extra sophistication. While porches and pergolas are extremely attractive, they’re also highly useful. 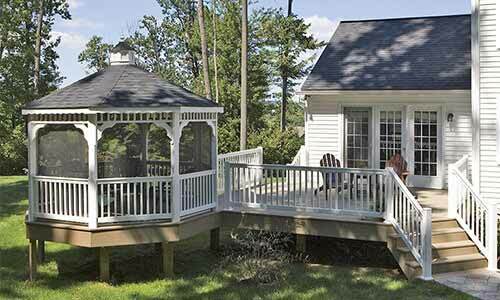 Handcrafted specialties like gazebos are also great for decks or backyards. They are a wonderful addition to any home. If you’re planning on throwing a barbecue, picnic or outdoor birthday party, a gazebo can be an enjoyable place for your guests to hang out, socialize, enjoy a few snacks and just relax and unwind. The gazebos we make are sturdy and durable and as a result are certain to last our customers for years and years. Re-decking, last but not least, is another one of our prominent services. If you’re sick of looking at the rotting, overly dry lumber that’s part of your current deck, our professionals can come to your rescue. After all, we know how to handle everything that comes along with redecking a deck. 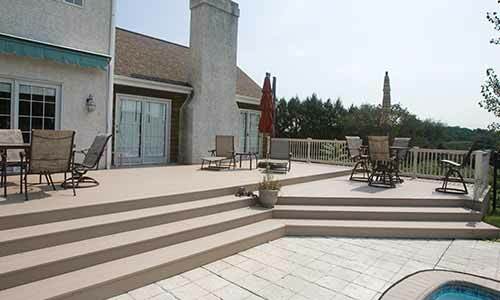 At Deck Craft Plus, we specialize in changing tired, unsightly old decks into gorgeous customized decks that are produced using modern composite components. These new decks can offer our customers years of convenience. They also don’t require much — if any — maintenance at all. If you want high-quality deck materials, we’ll never disappoint. Our decking materials don’t splinter or soak up a lot of moisture. They provide effective termite defense. They’re even highly resistant to slipping. Contact our Deck Contractors Today! If you’re in need of talented deck contractors PA, NJ, MD, & DE residents can rely on, give our licensed and trustworthy company a call as soon as possible. Our professional deck builders are experienced, seasoned and knowledgeable experts who are enthusiastic about the work we do. We’re also passionate about providing the best possible customer service. When thinking decking, just remember…“If you can dream it, we can design and build it”. Give us a call today to receive a free quote.